Our studies over the past few years have shown how closely the various animals of the Forest community interact with one another and with their common vegetation, and how dominant are the effects of grazing at all levels of the system. 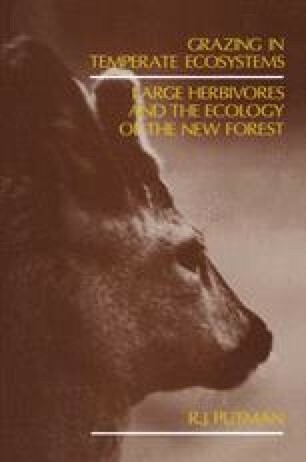 Ponies, fallow, sika deer, and almost certainly roe — although as yet we have not the data to prove it — adjust their diet so that at any season they are feeding on those foodstuffs which offer maximum availability of nutrients, particularly digestible nitrogen (Chapters 4 and 6). Foraging behaviour is a major influence on patterns of habitat use: habitat selection (preference) and observed occupancy of different communities reflect the changing choice of foodstuffs and their changing availability (e.g. Chapter 3). Different vegetation types suffer markedly different pressure of use, and within communities seasonal changes in foraging are reflected in different levels of grazing pressure at different times (Chapter 7).